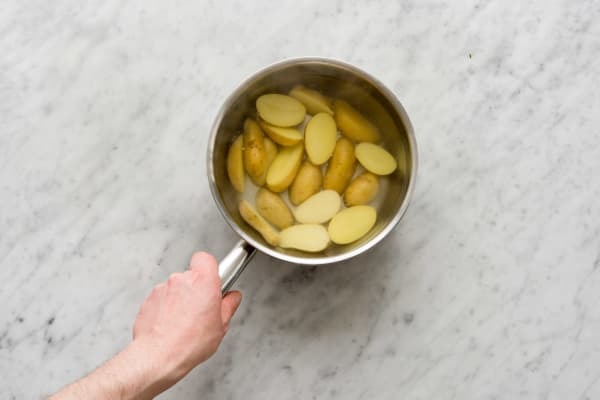 Cut the potatoes in half and pop into a large pot of cold water with a generous pinch of salt. Put on high heat and bring to the boil. Once they reach the boil, reduce the heat to low and cook for 20 mins. Tip: The potatoes are cooked when you can easily slip a knife through them. Next, make the dressing for your potatoes. Juice the lemon and mix half the lemon juice with the dijon mustard. 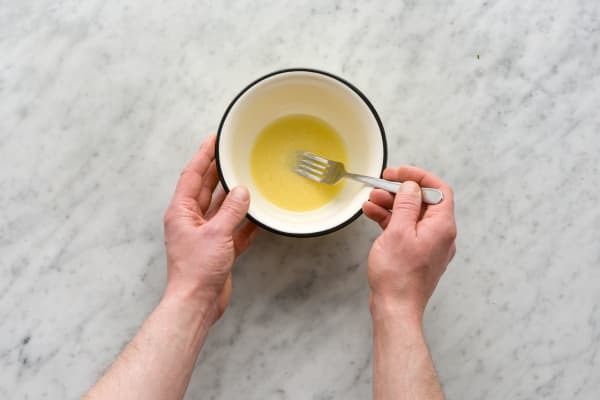 Whisk in the olive oil (as specified in the table above). Season with salt and pepper and then taste. Add more lemon juice or mustard if you feel it needs it. Finely chop the chives and mix half through the dressing. Keep the rest for later. 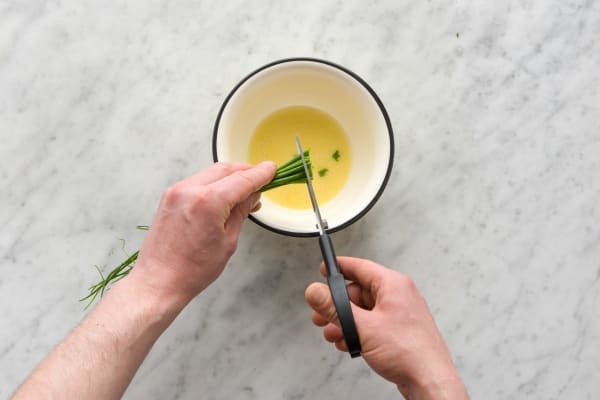 Tip: If you have kitchen scissors, use them to snip the chives rather than chopping them. Pre-heat your grill to its highest setting. Take the haddock and season each fillet with a pinch of salt and a grind of black pepper. Drizzle a splash of olive oil onto each piece of fish, place them on a sheet of foil and pop on a baking tray ready to go under your grill. 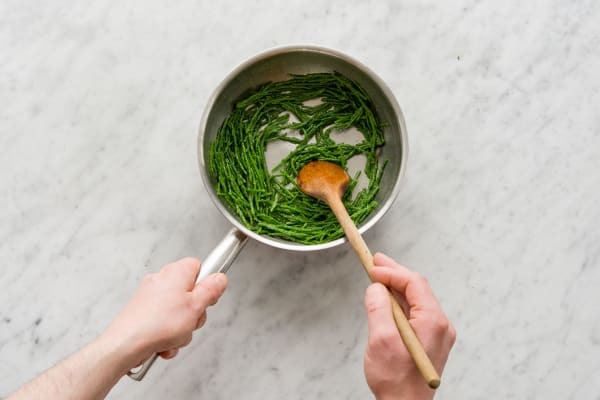 The samphire just needs to be warmed through, so give it a quick rinse under cold water and pop into a frying pan with a splash of olive oil. We’ll cook it right at the last minute. When your potatoes are cooked, drain and then return to the pot off the heat. Pop your haddock under your grill and cook for 5-7 mins or until the centre of your fish is opaque. As your fish cooks, gently warm your samphire on low heat. Add a splash of water to the pan to make sure it doesn’t fry. Dress your potatoes with the dressing and serve a generous amount on each plate. 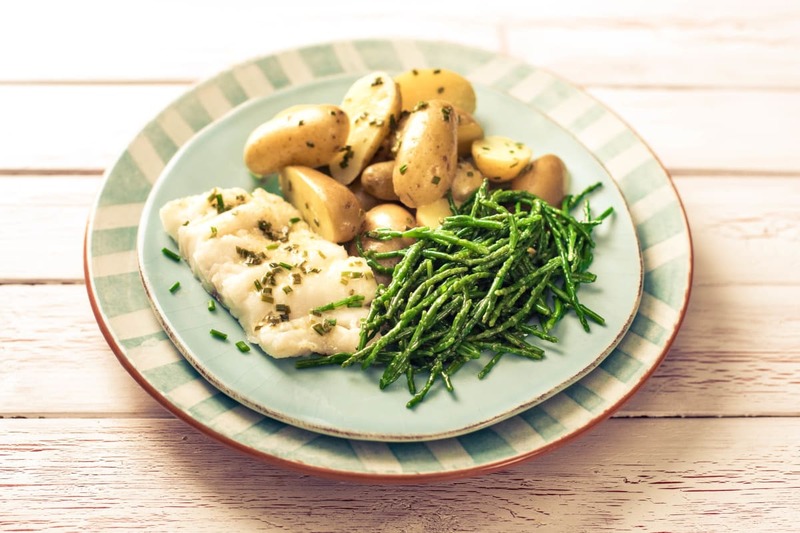 When your haddock is cooked, squeeze over some lemon juice and pop alongside your potatoes. Finish your plate with the samphire and a sprinkle of your remaining chives. Enjoy! !